One of my resolutions for 2018 was to correct my lapse in reading. In 2015-2016, I steadily increased the number of books I was reading, meeting my Goodreads Reading Challenge goal each year. For 2017, my goal was 20 books. I failed to meet my goal for the first time in two years. For the last two years I've also put together a little recap of my reading activity, an idea I borrowed from my friend Erin at like/want/need. I've always enjoyed doing them, and in the spirit of my 2018 motto, I've decided to dive back into blogging with an easy start - my 2017 Book Report. Seeing these covers laid out like this makes me cringe a little - because a good chunk of these books were audiobooks I have already read! It definitely throws into sharp relief how little reading I did last year. BOOKS BOUGHT AT INDIE STORES: 9 - this is the one positive from last year! Almost every physical book I read was purchased at an indie store. FAVORITE: A Handmaid's Tale by Margaret Atwood. Predictable, but dystopias are my favorite genre and it was far and away the best book of the bunch. Honorable mention to Harry Potter and the Half-Blood Prince, my second-favorite HP book, and My Grandmother Asked Me to Tell You She's Sorry (Fredrik Backman). LEAST FAVORITE: Pilgrim at Tinker Creek by Annie Dillard. This was very much NOT a book for me. I read this for a book club I attended one meeting for and quickly realized I was out of my element and that I needed to find a different club. LONGEST: The longest book I "read" (really listened to on audiobook) is an HP book for the second consecutive year - Harry Potter and the Deathly Hallows, 759 pages. SHORTEST: An exact tie between What Belongs to You by Garth Greenwell and On Love by Alain de Botton - both 194 pages. FUNNIEST: Continuing with my theme of reading mostly sad, dark or serious books, not many funny ones in this bunch. My Grandmother Asked Me to Tell You She's Sorry is the clear winner here, although I find Half-Blood Prince to be very funny in parts. BEST COVER: Not a lot of great covers here. I always love the HP illustrated covers, but my favorite is probably The Association of Small Bombs. WORST COVER: Pilgrim at Tinker Creek - a boring cover for a boring book. MOST OVERRATED: Pilgrim at Tinker Creek again. It astonishes me that this has 4+ stars on Goodreads. READ OFF MODERN LIBRARY TOP 100: 0 - in my last book report, I said I needed to focus on this in 2017. So much for that... at this rate I will finish this list when I am 100. READ FOR BOOK CLUB: 3 - I read the first two books for a book club I stopped attending, and I was able to join a great new club at the end of the year! GOAL FOR 2018: I decided to try to keep my same goal (since I didn't finish it last year). I'm already doing much better this year having read 6 books already! One of the most satisfying things I accomplished in 2015 was to fall in love with reading again. I had always been a voracious reader - my parents actually used to punish me as a kid by taking books away - but somehow, particularly during a tough period of my life, I stopped reading almost completely. I decided a few years back that I wanted to read Modern Library's Top 100 Novels, and from 2012-2014 all the reading I did was various attempts at struggling through Ulysses, and that was pretty much it. Then, this past year, I realized it made way more sense to start reading from the BOTTOM of the Top 100 list. I also put together a book club with some friends, which provided some great peer pressure to actually finish what I started reading. It really helped me to reintroduce reading back into my life, and I once again have piles of books all over my apartment because my bookcase is too small. READ: 12 books! I actually thought I had only finished 11 and was really disappointed, but then I remembered that I read Coming Clean on Kindle at the very beginning of the year, before I really started using Goodreads. FAVORITE: Easily Neverwhere, by Neil Gaiman. HATED: The Ginger Man by J.P. Donleavy. This is supposed to be a "wildly funny" novel, according to descriptions, and the first couple dozen pages involve the main character beating his wife and trying to strangle his kid. Har har. I can't believe this made the Top 100 Novels list; it's awful. LONGEST: Devil in the White City by Erik Larson - 447 pages. SHORTEST: The Postman Always Rings Twice by James M. Cain - 116 pages. FUNNIEST: Most of these books were not at all funny, so definitely One More Thing by B.J. Novak, though I wasn't a huge fan of it. SADDEST: Milkweed by Jerry Spinelli, told from a child's point of view during the Holocaust. Coming Clean by Kimberly Rae Miller is a memoir about a childhood spent living with hoarder parents; very sad in a totally different way. BEST COVER: I bought The Teleportation Accident by Ned Beauman entirely based on the cover, so that's a clear win. Honorable mention to The Postman Always Rings Twice. WORST COVER: The Ginger Man's gross illustration matches its repulsive interior. MOST OVERRATED: I know everyone loves Devil in the White City, but it left me cold, despite being from Chicago and loving the history of the city. 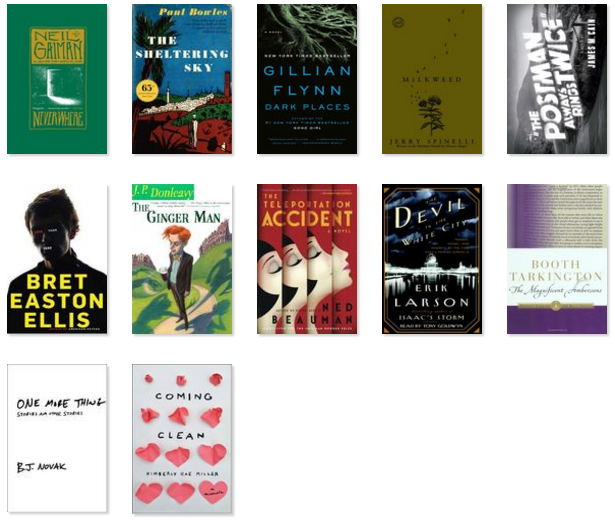 READ OFF MODERN LIBRARY TOP 100: 4 - I made it through books #100-97 (I finished #96 a few days into the new year). GOAL FOR NEXT YEAR: I'm being ambitious and going for 24, double what I finished this year. I'm on track so far!